A nine day mission to the Olivine Ice Plateau via the Barrier Range and the Derivation Neve. We had 7/9 days rain but were always in a tent or rock bivvy when it started raining - lucky timing! Flooding had washed the Dart road at Paradise away, so we started with an extra 12km walk to Chinamen's Bluff- a slog with heavy packs on hard ground. Day 1: Paradise to Daley's Flat Hut. Day 2: Hut to Derivation Neve via Seal Col and Desperation Pass, tricky with heavy packs and whiteout. Day 3: Neve to Blockade Stream, in whiteout. Half pit-day (rest day) due to rain. Day 4: Stream to Olivine Ice Plateau, in whiteout. Half pit-day due to rain. Day 5: Ascended Mts Climax and Destiny before descending to the Forgotten River Rock Bivvy, a route made much harder by glacial recession. We had to lower packs with the rope several times. Day 6: Rest day - it didn't stop raining for 44 hours and we only left the rock overhang twice (for calls of nature). Day 7: Biv to Olivine Flats via Forgotten River Flats. Half pit-day due to rain. Day 8: Flats to Olivine Ledge Rock Bivvy - we screwed up the route in the bush and had a horrible grovel through bluffs and "scruffy bush." 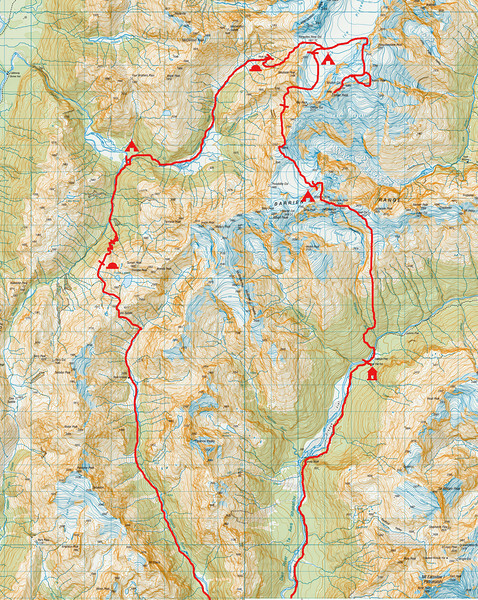 Day 9: Biv to Beans Burn via Fohn Saddle (in whiteout), and jetboat to Chinamen's Bluff. The team: Nina Dickerhof and Jaz Morris. With thanks to Geoff Spearpoint for route advice. Slightly cropped map. 1 grid square = 1 km. Left click on map then use top menu bar to enlarge.